Patrick’s upper right central and lateral incisor teeth were lost due to root fractures caused by his strong nightly grinding habit. 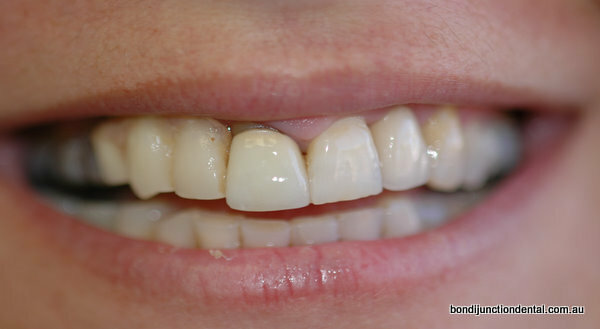 Patrick had a naturally occuring midline space (diastema) between his two front teeth. 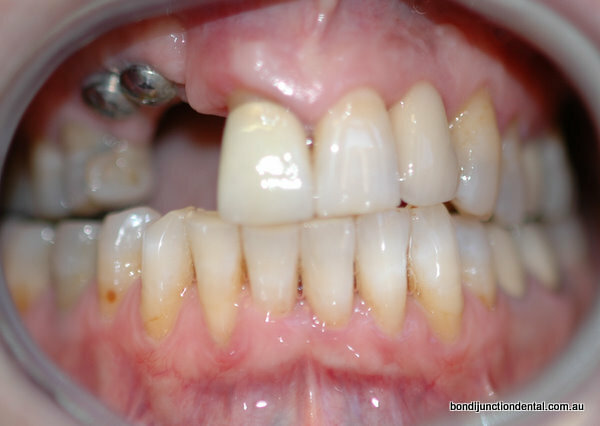 Patrick wished to replace his missing teeth, retain his midline space and not wear a denture. 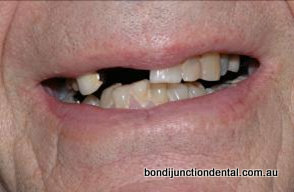 A bridge was not recommended as a bridge would require crowning the teeth on either side of the space resulting in the loss of the midline space. A bridge would cause an asymmetrical smile as the teeth in the bridge would have to be wider than his adjacent uncrowned front teeth. 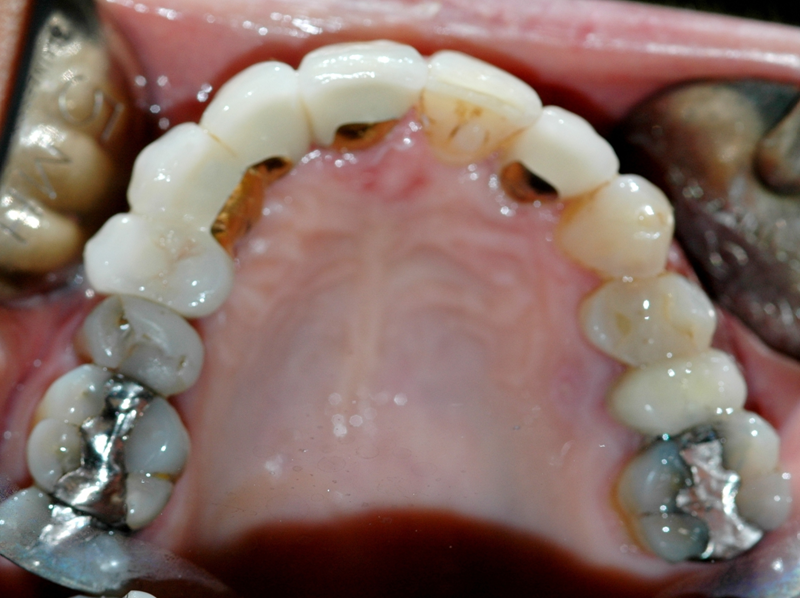 A high risk of further root fracture of supporting teeth would remain. Preferred treatment plan: two porcelain veneered crowns supported by two implant fixtures. George had been wearing ill fitting upper dentures for many years. He found them uncomfortable, they sometimes became loose at embarrassing times and food would get under the dentures. A bridge was not advised as the lateral incisor teeth on either side of the space were too weak to be the sole supports of the bridge and other anterior teeth would have be included in the bridge preparation. Additionally, his teeth on either side of the space were too divergent (pointing in different directions) to be used as abutment supports for a bridge. Preparing the lateral incisors would weaken and probably expose the nerve in these teeth. 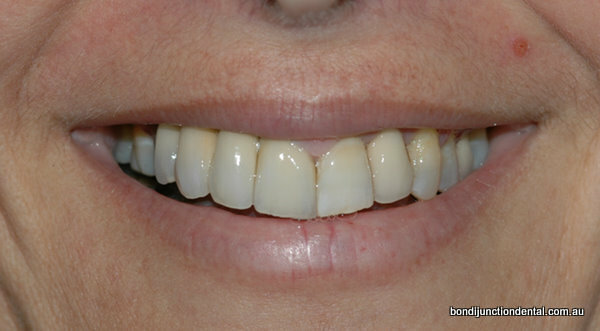 Preferred treatment plan: three porcelain veneered crowns supported by two implants fixtures. No need to crown adjacent teeth. Mary wore a part plastic denture to replace her missing upper right first premolar, canine and lateral incisor teeth. Mary did not want to go through life wearing a denture and did not like the look of her crown on her central incisor. Mary was happy with the appearance of her teeth on her left side and wanted to replicate their appearance in the new dental work. Her photos show excessive bone loss in the area of her missing teeth making implant placement and aesthetics very difficult. Two implants were placed in the premolar and canine region. There was insufficient bone to place an implant in the lateral position. 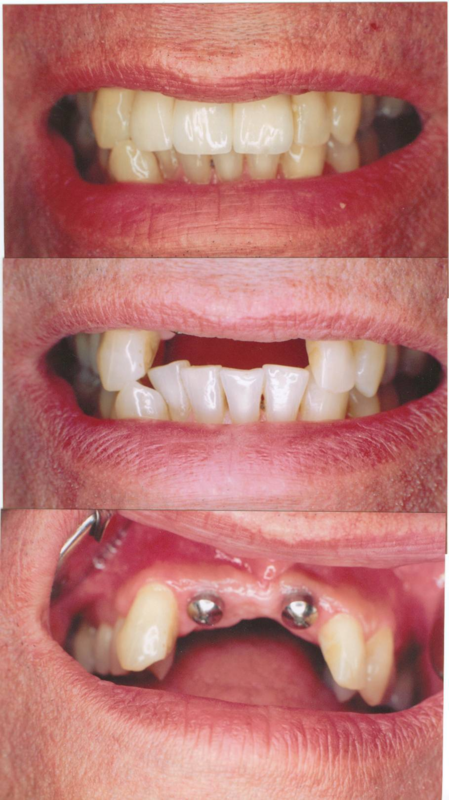 A three unit porcelain fused to gold bridge supported by two implants and a new crown on her front tooth were placed to match the shape of her teeth on her left side. Bill has an extremely strong bite and over the years has broken and split many teeth. Bill already had two implant crowns replacing his missing two central incisors. Despite wearing an occlusal splint (night guard) to protect his teeth from night grinding he managed to fracture his right lateral incisor next to the implants. 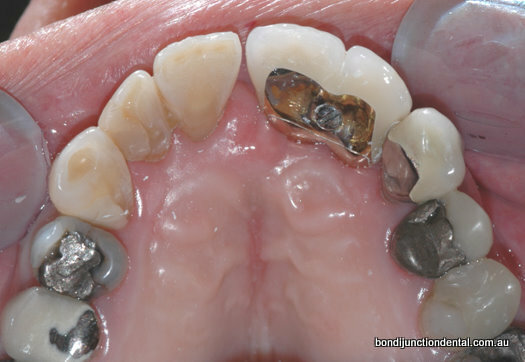 The remaning teeth near the fractured root were too weak to support a small bridge. Preferred treatment option was to simply remove the two old crowns on top of the implants and fit an immediate temporary implant bridge at the same time as root was removed. 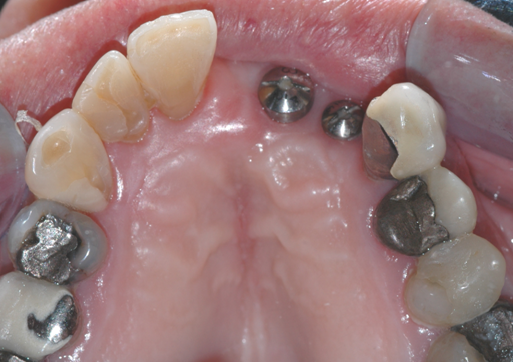 After a period of healing, but before the socket had completely healed, new impressions were taken and a porcelain fused to metal implant retained bridge was made on the two existing implant fixtures. This technique allows the false tooth (pontic) to emerge from the gum as if it were a natural tooth. No additional implants were required to replace the fractured tooth.